Meet Benji, the Fly Trap. I finally gave in and bought one. This is my second attempt to keep one. The first time, I barely researched about these carnivorous plants, and had no idea what they required to keep them alive except that I knew I could feed them insects. Well, it was a total fail. I was watering with tap water, probably too often than required. The whole thing was a mess. It finally grew fungus in the moss and I threw the whole plant out. This time though, I’m going in with my eyes wide open. I have done my research thanks to internet sources like fly trap care and the international carnivorous plant society. Light: Venous fly traps also known as Dionaea muscipula, apparently love a lot of light, so this is going to be a challenge growing it indoors, with north facing windows no less. I am therefore supplementing the light they receive with a cool white compact fluorescent lighting. This should promote foliage growth but not necessarily flowering. The fly trap I purchased has a flower stalk with unopened buds. I am tempted to cut it off as I want the plant to spend more energy putting out more traps and growing bigger but I am also curious to see if the buds will open to reveal the so-called unremarkable flowers. I’ve decided to keep it and see what happens. Water: Tap water leads to Fly Trap death! Or so they say. It may not happen right away but it will eventually once the dissolved minerals build up in the potting medium. Distilled or rain water works well. I am watering mine about twice a week with small amounts of distilled water. The set up I have is perfect because it keeps the potting medium moist but not water-logged. This set up also increases the humidity around the plant which they apparently love. I saw this set up at a garden store and it made so much sense, so I thought I would do the same. I keep the fly trap in an open container instead of a closed one to prevent that pesky mould. Soil: Fly traps prefer nutrient-poor soil. They are usually sold in peat moss or long fiber sphagnum moss. Mine came in sphagnum moss and I think it is best to keep them in the medium they came in unless you have the expertise to make your own mix. Regular potting soil is a no-no as most of them are enriched with fertilizer that will burn the roots. Dormancy: Obviously Benji is not in dormancy and I don’t think it ever was given the fact that it has a flower stalk. Most plants tend to go into dormancy in late October and begin active growing in mid February. It appears you can choose to skip dormancy, which I’m sure cultivators do in order to sell these plants year round. 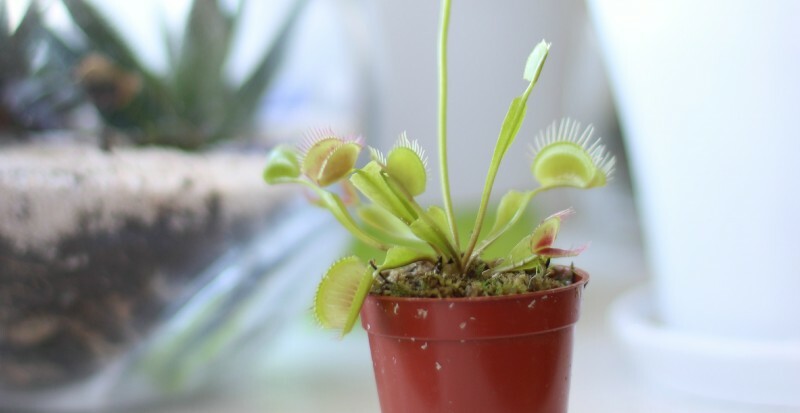 However, according to Fly Trap care, these plants become weak and will eventually die. Fly traps can be over-wintered indoors by a cool window sill or unheated garage. 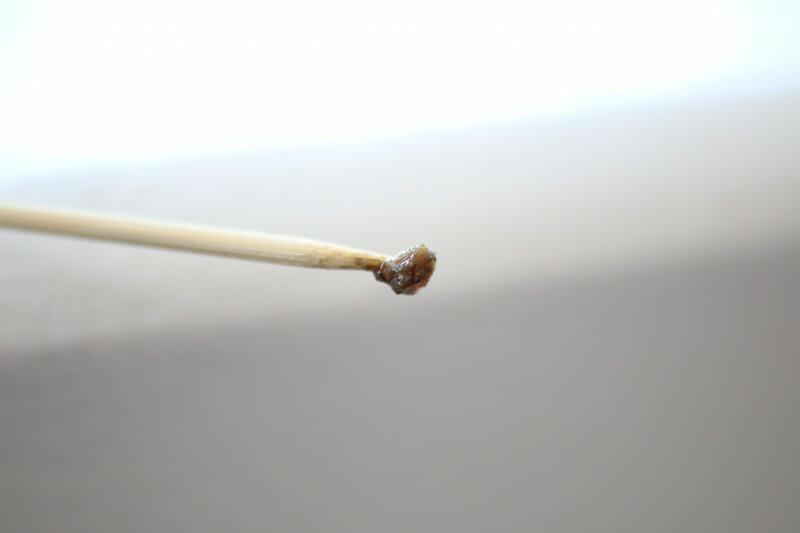 Fly trap care has more details on how to do this correctly. If I am able to keep this fly trap alive till October, I say it definitely deserves some dormancy period! Feeding Fly Traps: Human food or hamburger is an absolute no-no. Really? People actually do this? I am surprised this even has to be said. Every fly trap website I visited had this warning. Fly traps capture their own food while in the wild. However when indoors unless you have insects flying around, its impossible for the Fly Trap to get the nourishment it needs. One way to feed them is by giving them live crickets. Most pets stores have them. I thought that was a good option until I saw the crickets. I didn’t think I could bring myself to feed them to the Fly traps while they were still alive. So I settled on freeze-dried blood worms. 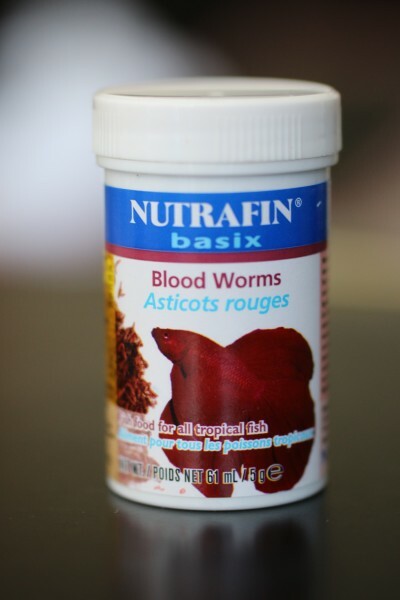 I purchased a small bottle of these worms and I think it will last a whole year if not more. 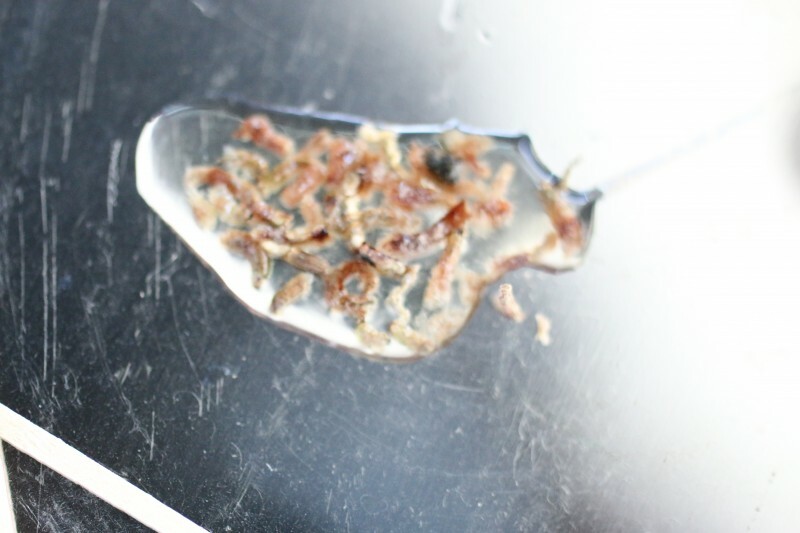 Basically, you put a few of the worms in a container and pour just a few drops of water on the worms. It is better to do it this way than pouring them in a container already filled with water. I find the worms end up floating and you may have to submerge them in order to get them to hydrate faster. After 2 hours they were nice and soft and I could roll a few on a skewer and feed it to Benji. I fed two traps. According to Fly Trap Care you can feed one or two traps a week. I squeezed the traps a bit tight to make sure they would completely close and complete the digestion process. A few minutes later I touch the traps to simulate movement and ensure the traps stay closed. I’ve had a few times where have opened up soon after and I think it’s because the worms are obviously not moving which makes the traps thinks there is nothing in there. I didn’t record the movement while feeding so here is a video of how fast it closes. Pretty cool. I don’t know why but I was somewhat scared while I agitated the trap, although I was an arm’s length away. The plant uses energy every time it closes and open so you shouldn’t close all the traps just for fun but one once in a while won’t hurt it. This plant fascinates me as I’m sure it does for most people. I hope to have several carnivorous plants in order to create a savage garden one day. Why the name Benji? Not sure but that is the first name that came to me when I thought of a name for it. I am open to renaming Benji. If you have any suggestions of a more befitting name comment below. Any one have Venus fly traps? Share pictures of them below. Any care tips especially care during dormancy is welcome. Hello Barbra! 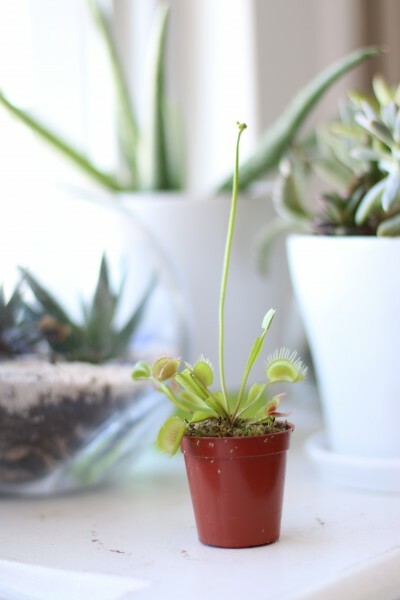 My birthday is coming up this month, and one of my friends said he’d get me a Venus Fly Trap, and while reading on how to care for these beautiful creatures, I found your blog. It’s really great, by the way, and I would love to know what kind of terrarium I should get. I love the bulb-like ones that hang from the ceiling, but are there ones deep enough to hold the plant? And is it true you can actually use a fish tank for a terrarium? I’d love to know what you’d recommend. Thanks and have a lovely day!! 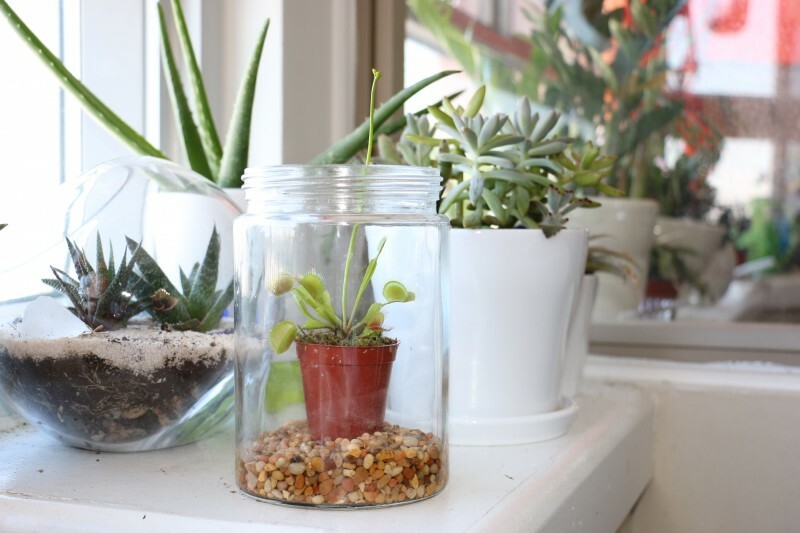 Any container really will serve as a terrarium as long as it’s clear and you can see through. Glass container would be my preference. I’d advice you to keep it in something that would make it easy for you to reach into. Those hanging glass terrariums are cute but might be too small for easy maneuvering if you have to. A glass jar with a lid from the dollar store will do just fine. And yes you could use a fish tank too!! A small but roomy fish tank ensures you can move things around if needed and you can have a bigger display of plants. However if this is your first time keeping such a plant I’d suggest you start small and see. All the best! Love venus flytraps, they always remind me of a horror movie – yet have always left me fascinated, so much so I setup my own website dedicated to them. Good luck with your little traps! I know Itzi. They can be quite scary. Did you see how I moved my hand so quickly in the video ? Lol. As long as you keep them at arms reach, you should be good. Dellob, I don’t have any experience with the pitcher plant but I have seen pictures of them in both open and closed terrariums, so I think they can survive well there. I think having them in a hanging basket outside would look great too. I’m definitely interested in getting one myself. Please share pictures when you finally get them.